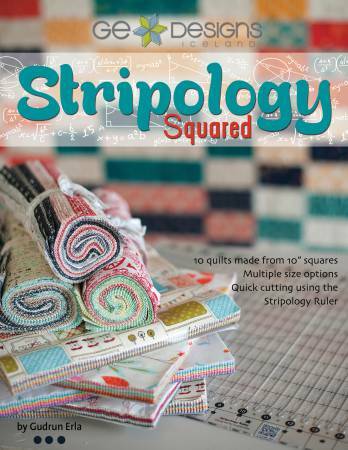 GE Designs, Stripology Squared- Beautiful 60 page book in full color with detailed instructions to make any of the 10 different quilts, each one written for multiple sizes ranging from crib size to Queen or King size. All of the quilts are made with 10” squares (layer cakes), and the amazing Stripology ruler by Creative Grids. (Item CGRGE1) Directions to use a regular ruler are included too. The book is bound with an OTA binding which allows it to lay flat when open. Great innovative techniques using your ruler in a whole new way let you create these quilts in no time.